FRANCINSTIEN was developed in the early days of CDs because, early on, it was obvious that CD quality (although exemplary in many respects, and technically much better than LPs), lacked "something". Part of this was due to an unwitting enhancement to the stereo signal caused by crosstalk in the cartridge. This realisation led to the development of FRANCINSTIEN. In fact, some of the early marketing of the FRANCINSTIEN positioned the product as an enhancement which made CDs sound more like vinyl LPs. Measured crosstalk from a moving magnet cartridge (sweep recorded on one channel only). Note how the crosstalk increases with frequency; just what is required to improve the stereo image! This is what FRANCINSTIEN does, but in a controlled and accurate way. The Groove algorithm does not incorporate inter-channel crosstalk. Therefore, to get the full LP emulation in Stereo Lab, Groove should be selected as a downstream process after one of the FRANCINSTIEN shuffler filters. Note that if files are Groove processed at 44.1kHz or 48kHz sampling that the output is always upsampled to double sample-frequency and the bit depth is always increased to 24 bit. A schematic of the FRANCINSTIEN and Groove algorithm in cascade is given below. 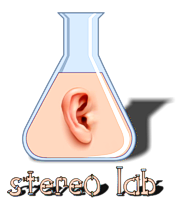 Stereo Lab will fail gracefully if the 4GB audio file size limit will be exceeded during Groove upsampling. 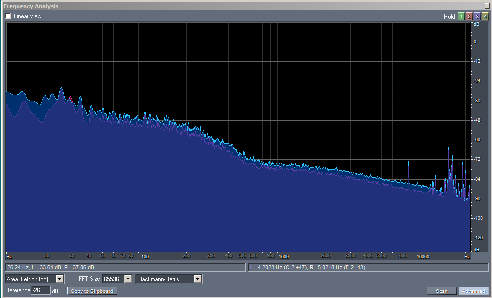 44.1kHz/16-bit WAV files can be 6.8 hours long before this limit is reached. 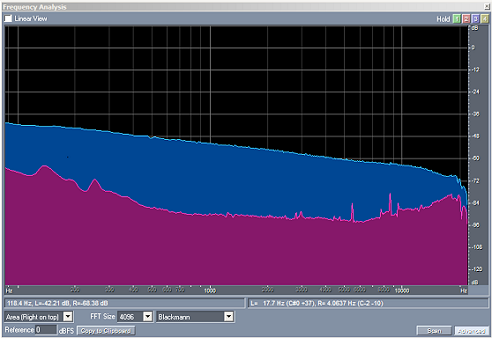 But 88.2kHz/24-bit WAV files can only be 2.25 hours long. If you do have some very long audio files to convert, break them up so that this duration limit is not exceeded. The Groove algorithm incorporates two models: the model of the stylus moving in the modulated groove; and the effect of the surface of the vinyl medium. Both models incorporate some user-selectable parameters and these are exposed on the user-interface of the Settings dialogue via two sliders. The first of these controls the degree to which the stylus model affects the upconverted signal. With the fader in the default (central) position, the effect is typical of that produced by a high-quality stylus when it traces the outer grooves of a new, 12" disc. This is the recommended setting. Sliding the fader to the right models the effect as the stylus moves towards the centre of the record. The subjective effect of this is... well, subjective! Some feel this adds "warmth", others perceive this as a "roughness"*. When the slider is moved to the left, groove diameter is increased still more. It's interesting that 33&frac13; records were originally developed as eighteen-inch diameter discs (for cinema sound), so you can experiment to see what these might have sounded like! * Harmonic distortion increases with the fourth power of reducing groove velocity, so don't overdo this! The second slider controls the degree to which the surface-model affects the upconverted signal. Once again, with the slider in the central position, the amount of surface noise which is added is similar to that measured from a brand-new, 180 gram LP. Surface noise has several subjective effects; it provides a "baseline" to the signal and adds a sense of ambience. It may also provide a kind of "subjective dither" to the hearing system. The groove-noise control range is extensive so that the noise signal peaks from -70dB at the left end-stop of the slider travel, to -30dB below peak level at the right end-stop of fader travel. 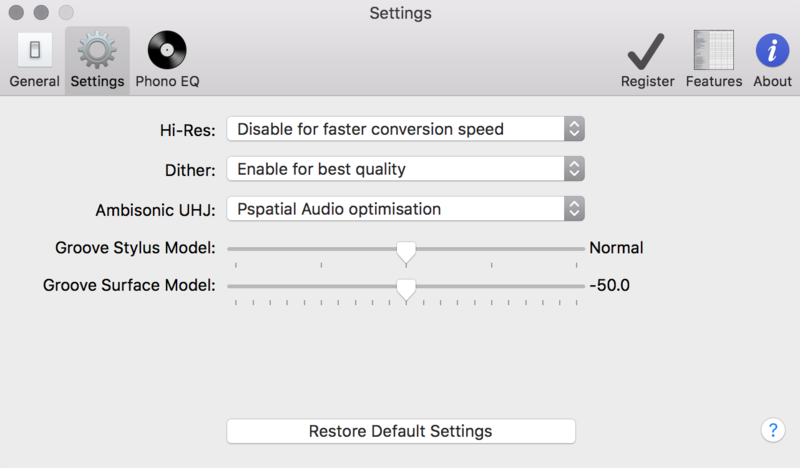 The default setting causes noise to peak at -50dB below 0dBFS. This is the recommended setting and may sound quite high, but the spectrum on the noise falls sharply with frequency, so its subjective effect is much less than the -50dBFS figure might lend you to think. 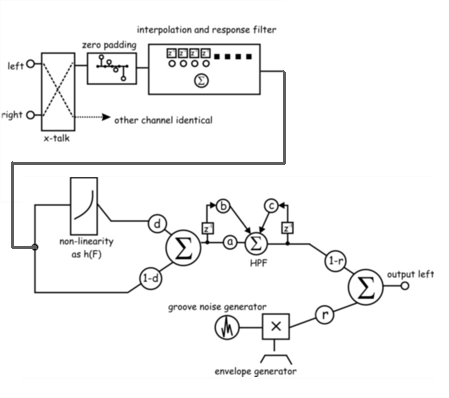 This noise is not a sample: instead white noise is generated mathematically and shaped in a digital noise-shaping filter. There is no attempt to generate "clicks and pops" since these are regarded as a non-desirable feature of LP replay. The Groove (Fast) and Groove (Best) post-processes are identical except that Groove (Fast) incorporates an upsampling interpolation filter which is optimised for calculation speed whereas the Groove (Best) process incorporates an upsampling interpolation filter which is optimised for accurate frequency response and suppression of aliasing components. Best is the recommended setting unless your Mac is old and slow! If the sliders for stylus model and surface model are left fully leftwards the result is replay from a "perfect" vinyl LP. Note that if files are Groove processed at 44.1kHz or 48kHz sampling that the output is always upsampled to double sample-frequency and the bit depth is always increased to 24 bit. This may be used as a general purpose post-process following the selected stereo enhancement process. 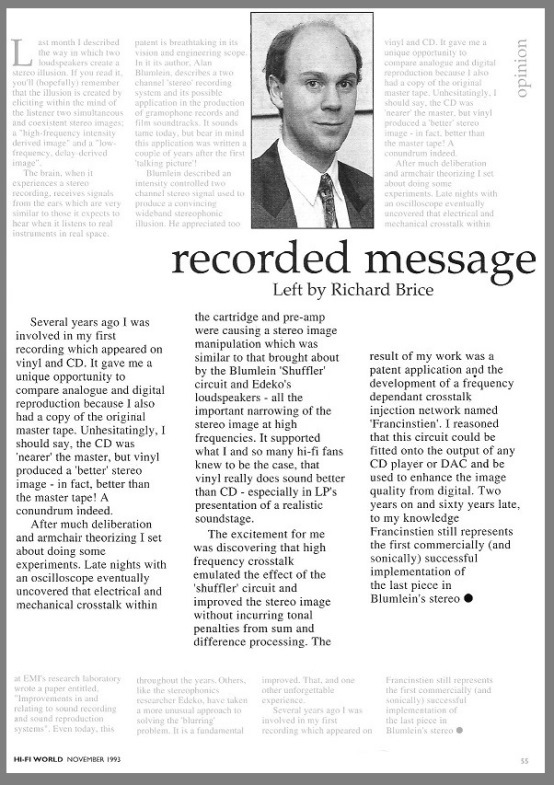 Ironically the Groove algorithm brings us full circle because as Richard Brice, the inventor of FRANCINSTIEN wrote back in 1993 in Hi-Fi World magazine, the FRANCINSTIEN circuit was actually developed in response to an observation that vinyl records sounded better than CDs when the silver discs were first introduced (see below).